The other day was in Houston again (Christmas shopping, since I forgot to do Amazon and Walmart wasn't going to cut it) and I noticed a very large sign on Westheimer near Hillcroft and Voss, which advertised Select Jewelers (further up Voss). What was the sign's original purpose? I imagine it was for a business, and I immediately thought Safeway (or Weingarten) since I knew it was at that intersection, but the Safeway store was on the southwest side of the street (now Ross Dress for Less). What was it for originally? The only other theory I had was that it was for what is now the Water Mill Apartments, but I'm not sure on that either. Anyone else have any insight? Maybe it was for the gas station that used to be where the CVS is now on the corner? That would be pre-2005 ish. I thought about the gas station, but it's on the wrong side of the property. Actually, pre-dating CVS wasn't a gas station, there was a restaurant on the southeast corner of Hillcroft and Westheimer, built after 1995 but torn down by 2005. The strip center of 6509 Westheimer was built in 1980, but pre-dating that was a restaurant that had, in 1978 a sign about the same length (looks like a different shape but that could be just the garbage quality of the image talking). The restaurant was Pinos, and it was there well before 1995. It was one of Marvin Zindlers favorite places, and I ate there many times in the 80's with friends. You might be able to get some information on the sign by parking nearby and looking at the permit stickers. I haven't found a sign permit database that's accessible to the public. They must have done substantial renovations since 1995 when they expanded into adjacent lots because the differences between the early 2000s and 1995 (plus 1989) are quite different. Major renovations I can buy, though, and the south part of the restaurant with the red-looking part of the roof helps substantiate that claim. The big sign can be seen on the northeast part of the property, but it appears to be on the other side of the property, otherwise CVS would've used it or wrecked it. Besides, the other businesses in 1995 help disprove the notion that it was Pinos' sign. After doing some digging, Pino's opened on Hillcroft in 1970. Their original restaurant was on Cullen. The property on Hillcroft was bought in 1969, and sold in 2004. Pino Farinola, the owner of Pino's had a fair amount of prooperty out that direction, including a house in Rivercrest. I haven't found any documents on the sign yet, though. 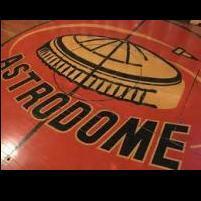 I remember that sign from I think the mid 70's and seeing everyday on the way to school and reading it. It had moving "lit up" letters and it was the first of it's kind or something like that. Don't think it had anything to do with the local businesses. Im sure somebody out there knows more about it. You can see that there are two buildings that are in 1995 but not 2001 in my last screenshot...in 1990 there was a Taco Bell and Dunkin Donuts in the space just west of the sign. But it's unlikely that the sign was for those two buildings, because, again, it's on the other side of the sign, and the place closest to the sign was Dumpling King, which was operating there as far back as 1990. Looks like a billboard to me. You can see the shadow of a billboard in that location in the 1968 historic aerials. That one appears to be at an angle to Westheimer vs the current one, but I'd guess that the current one replaced the prior one at some point. 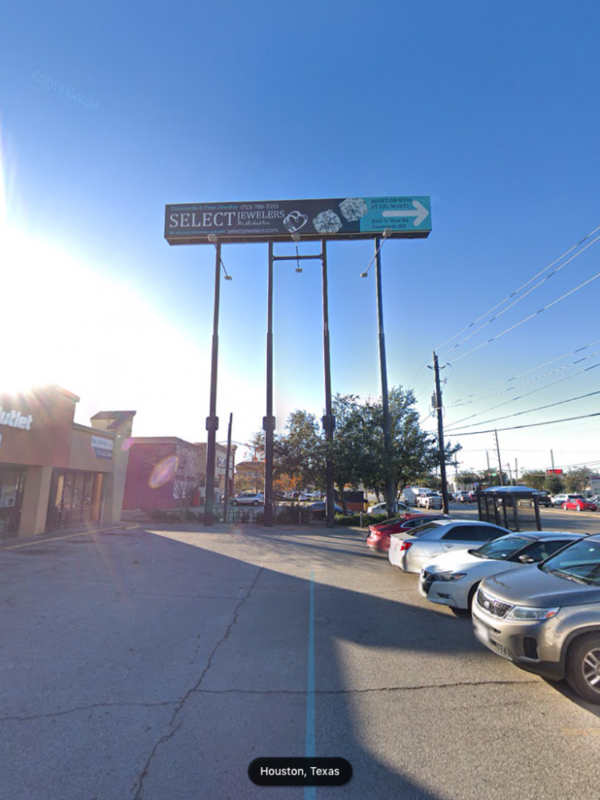 From google streetview and hcad records it also appears that the billboard is on the property of the strip shopping center next to the cvs. At the time it appears Westheimer was a 4 lane suburban road with grassy medians. In the 1966 aerial it appears that area was someone's front yard. By '68 the house was gone and was replaced by what looks like a commercial building with the billboard in the corner of a fairly large and half-empty lot. I don't know if this helps anything but here are the businesses that were on that corner in 1976. Note that the Hillcroft numbering seems slightly different now. I'm sure you've seen something like this...even if not in person. This one is from 1941 so they've been around for a long time. I remember those portable signs that had a large red sheet metal arrow that would point at the business, and a signboard surrounded by flashing lights. They were common on Lower Westheimer, and favorites of massage parlors and strip clubs. Or the variants without the arrows, which used to be almost as ubiquitous as mosquitoes or cockroaches in Houston. Is this the sign you are referring to?